The Vitamix 7500 Comes to QVC - Got Greens? 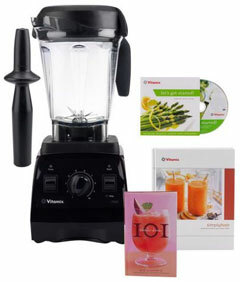 » QVC Vitamix TSV Deal « Ends Today! The latest and greatest blender from Vitamix makes its appearance on QVC for a limited time, just in time for the Holidays. Did you miss the super deal on QVC? Not to worry – you can get the best price on the Vitamix 7500 or ANY Vitamix with our » Vitamix Promotion Links. » Click Here to get FREE shipping and the BEST deal on ANY Vitamix purchase. Your discount will automatically be applied when ordering direct from Vitamix. We just love this blender. For one day only – December 2nd – you could have gotten the best price on a Vitamix 7500 from QVC. Don’t delay, whenever Vitamix shows up on QVC as the TSV it goes quick! This is Vitamix’s newest and best blender. It has the more powerful motor that runs quieter and comes with the latest squat 64-oz container with the wider base for more efficient blending. And, now it is short enough to fit under most standard kitchen cabinets so you can leave it on your counter. What do you think of the Vitamix 7500? Did you get the DEAL?